I knew so many people back in the Jesus Freak days. Most I count as acquaintances and some are still dear friends. I treasure all the memories. I was thinking about Duane Pederson recently when someone sent me an email asking me to pray for him. Duane Pederson was an entertainer of sorts and lived in Hollywood California during this era. The group of Christians that I was involved with decided to invite him to come and speak to the Church in Cincinnati. Since I had a car I was elected to drive Duane around from his hotel to the Church and back. I was also recruited to sing a few songs. Duane was probably about 30 years old at the time, which meant he was ancient to a 19 year old boy. As far as a persona of a Jesus Freak, he was far from typical. My attire was bell-bottom hip-hugger jeans, tee shirts and sandals. Duane had on pressed dress slacks, a Vanhuesen shirt, Florshiem shoes and a brown leather jacket. But here he was the founder of the Hollywood Free Press, which was an evangelistic newspaper and one of the leaders of the Jesus Movement in Los Angeles and Hollywood. The Hollywood Free Press was coined the terms Jesus People and the Jesus Movement. So I found myself driving him around Cincinnati in my dented Plymouth Fury station wagon with four snow tires. Duane seemed shy and introspective until it was time for him to speak. My best memory of him was when he took me aside and laid hands on my head to pray for me. The Christian walk is a funny old road because it takes each of his in such different directions. Many of my friends were called into the ministry. Some were called out of the conventional church to start their own churches. And others left churches to join other churches that seemed to be totally polarized from the ones they belonged to when I knew them. Pederson is no exception. He went from being an evangelist to becoming a member of the Eastern Orthodox Church where he took Holy Orders as an archimandrite. This is a cleric ranking below a bishop and also a title for a married cleric. He served for more than a decade as the head of the Orthodox Christian Prison Ministry. Now retired, Fr. Duane still ministers to prisoners and those on the street, as well as serving Los Angeles area parishes of the Antiochian Orthodox Church. The Antiochian Orthodox Church claims to be one of the five churches that composed the One Holy Catholic and Apostolic Church before the Great Schism. 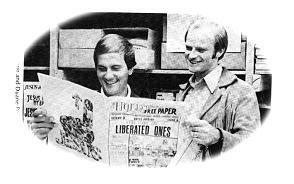 Father Duane recently edited a 35th anniversary edition of the Hollywood Free Paper. As the hymn says Farther Along We'll Know All About It. We walk the path, we learn, we grow and we become what The Father wants.